The Melbourne CBD has a number of extremely popular high-end Thai restaurants however what I often felt a bit let down by the lack of a mid priced option that served interesting and authentic Thai food. Lament no more, let me introduce you to my new favourite Thai restaurant Le Bangkok… Situated right in the middle of enemy territory of Lonsdale Street, Le Bangkok is a lovely little forward South East Asian position forged into this Greek stronghold. Perhaps it is this unusual location that caused a little initial scepticism on my part but any doubts were quickly erased when the meals started arriving at our table. 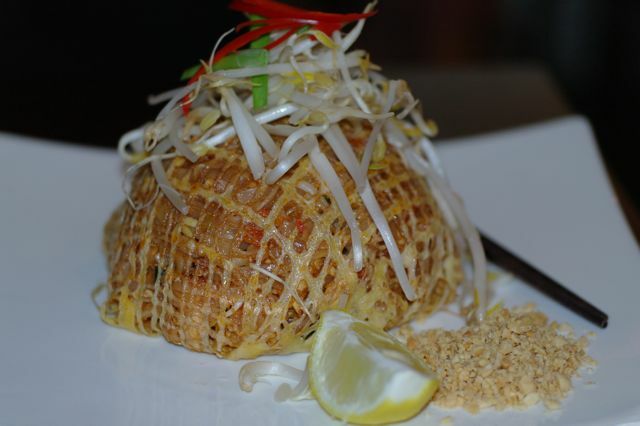 This beautiful creation is the now commonly accepted modern presentation of the infamous Pad Thai. I often get a bit carried away about authenticity and chicken Pad Thai always cops a bit of a tut tut but really it's all mostly tongue in cheek. Now ‘the rules’ specify that Pad Thai should be prawn and tofu but rules are meant to be broken and I am regularly finding that the Thai are often happy to break ‘the rules’ when it comes to Thai food, usually with delicious results. Beautiful presentation aside, this dish had all the right notes, a lovely tamarind sourness, perfectly cooked noodles, subtle delicate tofu and crunchy sprouts. Often it’s a single dish that can leave a diner raving about an establishment and certainly in the case of Le Bangkok it was the Yum Pak Boong Krob that for the next week I was gushing about to anyone who would listen. The crunchy egg coated deep fried morning glory is just delightful and a wonderful textural accompaniment to the sublime curry sauce. The sauce is also very special, I describe it as a tangy salty Tom Yum flavoured sweet spicy curry sauce of prawns and pork. It's just another reason I can’t wait for summer as I reckon Yum Pak Boong Krob is perfect beer drinking food. I've tried a few different variations Som Tum these days and always enjoy its spicy zestly saltiness. 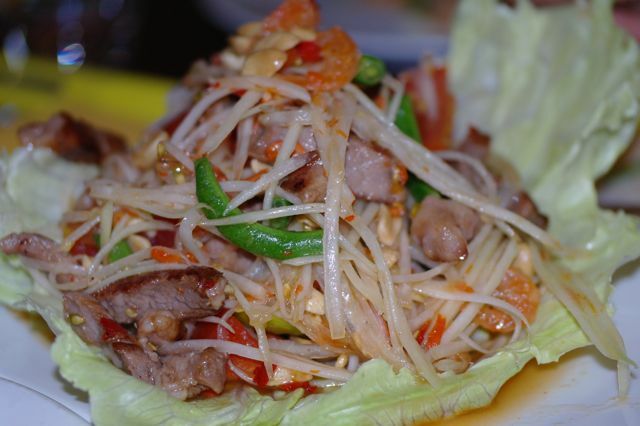 Le Bangkok offers a a standard Som Tum as well as a few more interesting options including one with grilled pork neck, Som Tum Moo Yang. I really enjoy the addition of a bit more protein in the Som Tum and it doesn’t hurt that the extra protein is gorgeous smoky grilled marinated pork neck. This was a really great Som Tam but as is pretty much always the case it was incredibly spicy and definitely not a dish for the chilli averse. Fortunately I'm not one of those poor souls. When you visit Le Bangkok as I hope that you do, you need to know to ask for the ‘spicy menu’. If you are not Thai in appearance the staff will provide you with the ‘western menu’ at which point you should politely decline and ask to be brought the menu tactfully referred to as the ‘spicy menu’. The spicy menu has all the interesting stuff and yes it also has a lot of spicy things too. If you’re anything like me you love discovering interesting new dishes that hopefully yield wonderful new taste experiences and this dish Khao Klook Gapi (Shrimp Paste Fried Rice) was certainly one of those occasions. I had read a lot about the infamous Gapi (Shrimp Paste) that is often described as almost as integral to Thai cuisine as fish sauce but I had never had a dish that really showcased its special flavour and qualities. I found the flavour quite interesting and as usual difficult to describe, however I will say that it wasn’t as powerful or obtrusive as I had expected. Actually it was quite earthy and musky with a bit of durian funk like quality. The traditional presentation of this dish is also very special as all the ingredients of the fried rice are deconstructed and the diner mixes them at their leisure. Another must try dish for those food adventurers out there. If you ask even the most enthusiastic foodie to name three Thai soups I reckon most will get stuck after one, Tom Yum. And it seems this is also the case for many Thai restaurants. One of the ways I quickly assess the depth of a Thai restaurant’s menu is to check the soups available and more often than not it isn’t the plural soups but rather the singular soup, being Tom Yum. 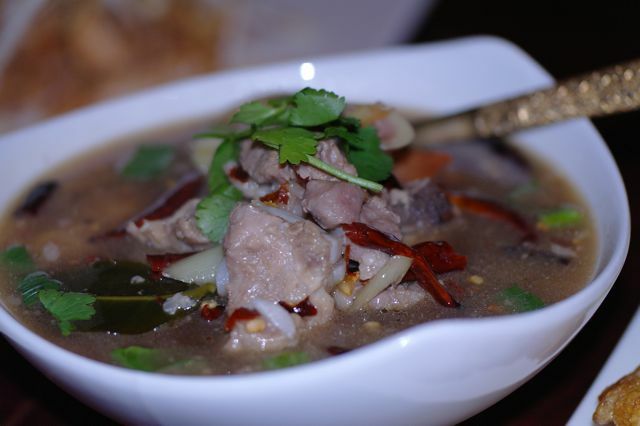 This lovely number is the northern soup Tom Sap with soft bone pork. With predominant flavours of galangal, lemongrass and kaffir lime leaf this spicy Issan soup is both subtle and strong at the same time and definitely a nice change up from the usual (but still delicious) Tom Yum. Obviously I have a weak spot for pad krapow, it’s such an easy to eat and easy to prepare dish that for me really brings out the best qualities in good old steamed jasmine rice, they just compliment each other so well. Le Bangkok’s version of krapow has a few compromises in the use of capsicum rather than chilli and green beans over snake beans but one of the great things about krapow is that as long as you get the basic flavour right you can add pretty much whatever asian vegetables you have on hand. 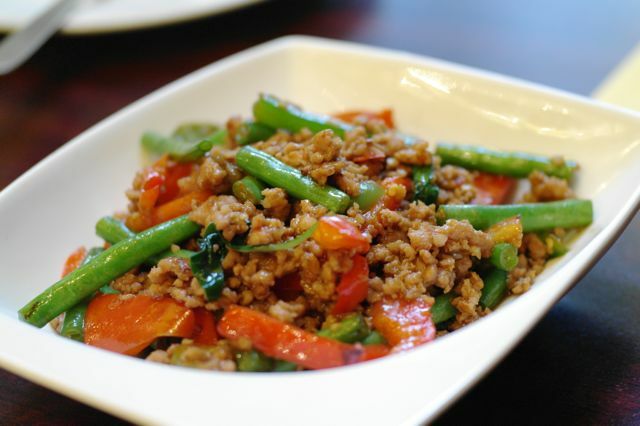 I myself am quite partial to pork krapow with baby sweet corn and often cook it at home. Oh and a point deduction for no crispy fried egg, seriously there has to be a crispy fried egg or it just isn't quite right. 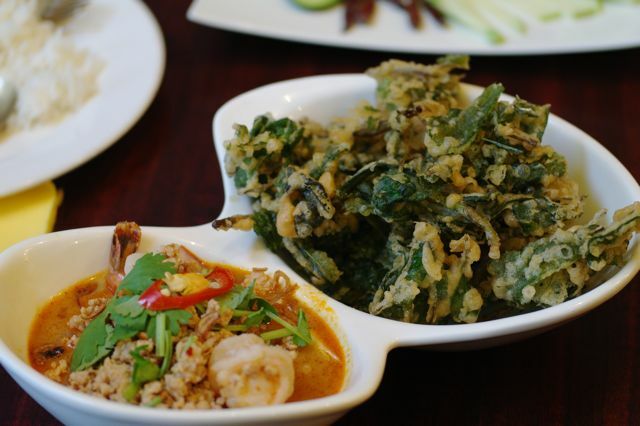 This medley of deliciousness is another of Le Bangkok’s specialties. Awesome Thai flavoured cakes! And I mean awesome. These are all so great that it’s impossible to choose a favourite. Unless you’re very serious about your cake I suggest you bring along a few friends and share them around so you can sample a bit of each as they are all amazing. 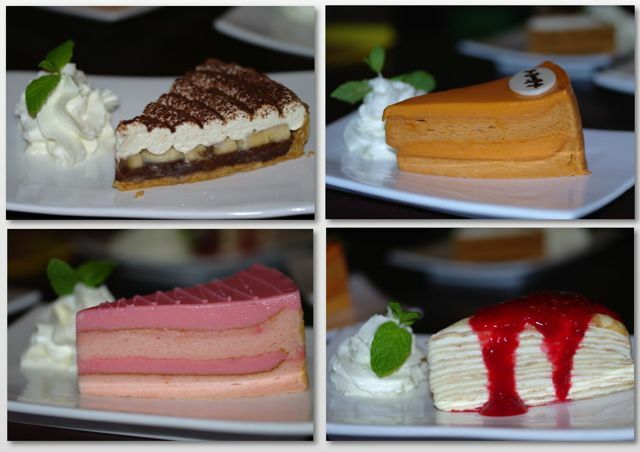 Clockwise from top right, you have Cha Yen (Thai Milk Tea) cake, Raspberry crepe cake, Nom Yen (Hales Blue Boy Sala Flavour) cake, and finally Banoffee (Chocolate Banana Cream) pie. Did I mention all these cakes are totally awesome! As usual this post is longer than I would have liked but when a restaurant has so many interesting and tasty meals it’s hard to leave anything out. In saying that I did have to make some tough editorial decisions (made easier by some less than great photos) to leave out a few excellent meals. Sadly the Pla Tod Lin Suan (Deep Fried Snapper in the Jungle), Yum Poo Nim Tod (Soft Shell Crab Salad) and Miang Kham (Betel Leaf wrapped bits) have all had to be left on the cutting room floor. Of course this doesn’t preclude you from getting down to Le Bangkok and giving them a go. At the end of our meal Le Bangkok’s lovely owner Khun Niew remarked to me that when she goes back to Bangkok these days she is less excited about the food because so many of her favourite Thai meals are now available in Melbourne. While the depth of food offered in Bangkok seems never ending, I definitely agree with Khun Niew that if you know where to look you can certainly go pretty close to eating like a Bangkok local and when it comes to where to look, Le Bangkok is a great place to start. This review was conducted in my capacity as restaurant reviewer for ‘Thailiciouz’. I dined as a guest of the restaurant who knew in advance that I would be dining there, and selected the dishes they wanted to showcase. Please visit www.thailiciouz.com.au for information on how you can receive hot deals from various Thai eateries, massage parlours and other contemporary Thai businesses. Hi Corrie, I hope you enjoy Melbourne. 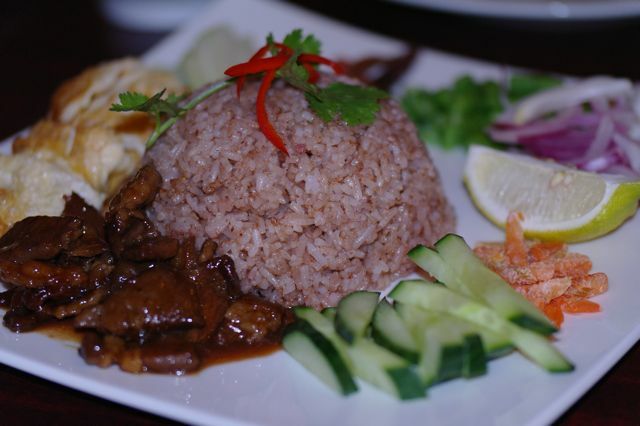 If you only order one dish at Le Bangkok it has to be Yum Pak Boong Krob!